As corporate America has evolved, more and more emphasis has been placed on Return-On-Investment or ROI. The burden of ROI proof initially fell to the operations side of most companies, but now even hard-to-quantify business areas like Human Resources and Risk Management are asked to prove the value of their stated best practices. Employment background screening is widely recognized as a necessary process that is designed to keep out undesirable candidates, but it also represents a significant expense. The question then is this: How much actual dollar value does a background screening program deliver? 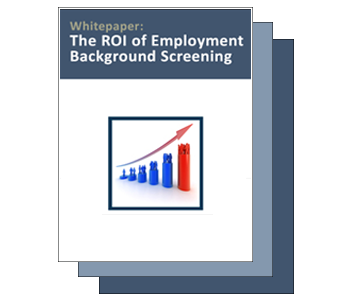 This white paper provides a useful ROI formula and explanation of ROI for employment background screening.